Neurotris Conductive Gel is a Paraben free, chloride free, non-allergenic, odorless, colorless and water soluble conductivity gel used with our SX Series facial system’s Probes”. 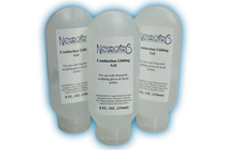 Neurotris Conductive Gel works by wetting the skin, thereby reducing skin resistance and allowing for a more complete delivery of the InSight WaveForm™. Use with the SX series machines & the Pico Toner.